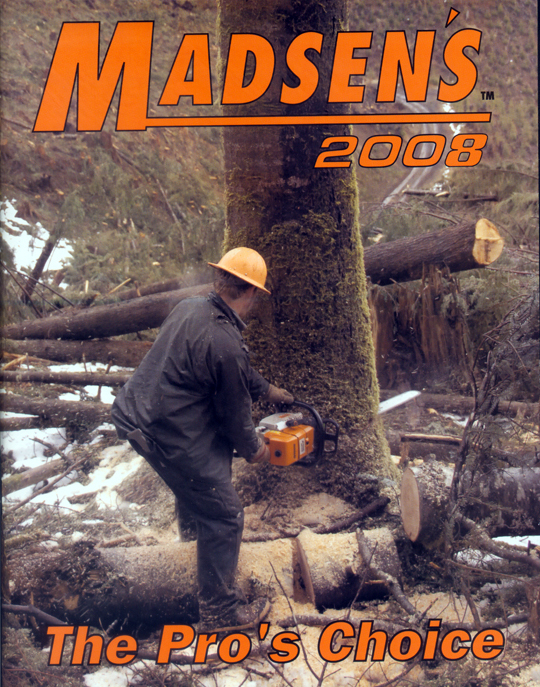 In 2006, Madsen's celebrated sixty years in business. It was also our twenty-first cover image. Pictured above is Orv Campbell cutting an old-growth fir on a strip near Doty, Washington. Orv is shown running his Stihl 084 fitted with a 50" bar. Orv likes saws with lots of power and believes there is no-such-thing as too much. When working in smaller wood, he concedes that the big saw is a little heavy, so he switches to his lighter saw -- a Stihl 066. 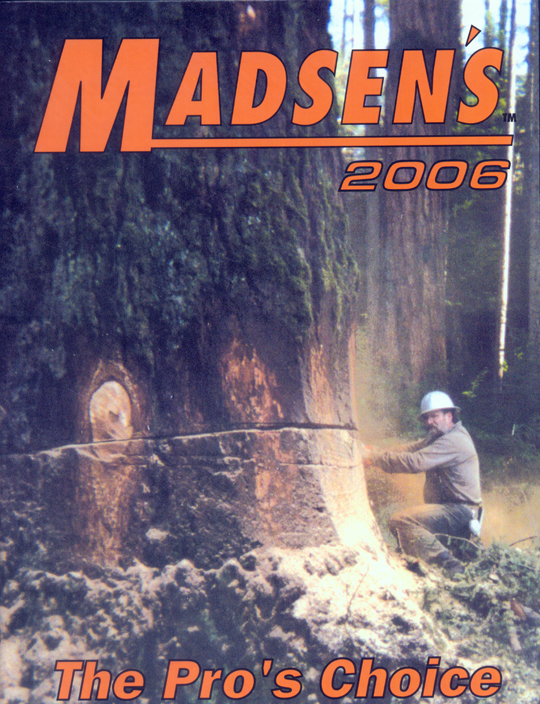 Orv has been a customer for a long time and says of Madsen's, "You guys understand timber fallers and I appreciate that." 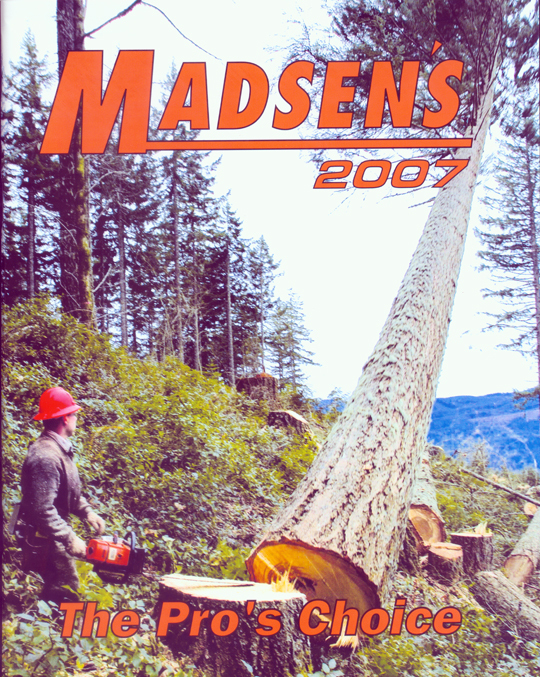 The photo on the cover of our 2007 catalog was a stock photo taken by Mike Crouse, the publisher of Logger's World Magazine. It was another great action shot with a nice fir caught in the air on its way to becoming a nice log. 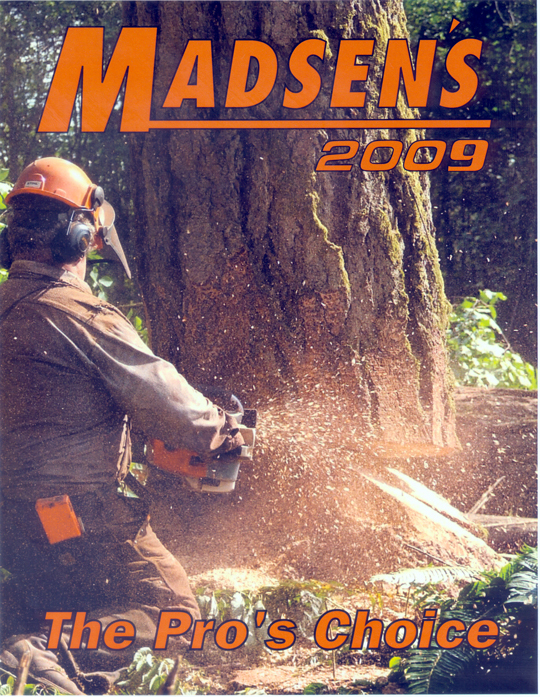 The photo on the cover of our 2008 catalog was a stock photo also taken by Mike Crouse of Logger's World Magazine. 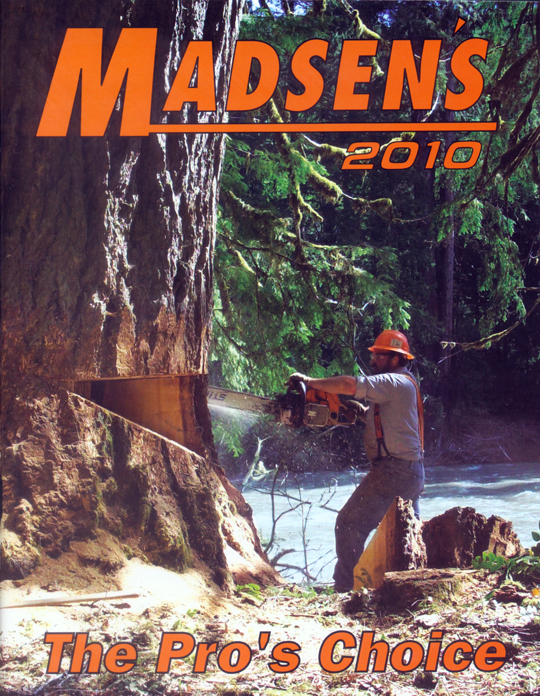 The 2009 catalog cover featured Ron Henley, working on a strip near Yamhill, Oregon. The photo was taken by one of Ron's relatives. It is also a good action shot with lots of sawdust filling the air. See more photos of Ron and read more about Ron in the photo album section of this web site. In 2010, the cover shot is of John Pollman of Randle Washington. Yes, that is a river he is standing next to. This photo was taken while John was removing a big danger tree for the US Forest service in a campground. John is the son of Jack Pollman, who was featured on the cover of our 1994 catalog. John and his family have been friends and customers of Madsen's for over forty years. There are more photos of John and this job in the photo album section of this web site.